Potent, selective GABAB antagonist (IC50 = 5 nM). Prevents agonist binding (pKi = 8.35) and blocks GABAB responses to Baclofen (ab120325). Inhibits GABA and glutamate release (pEC50 values are 8.08 and 7.85, respectively). Stimulates glucose induced insulin secretion. Functional Studies - CGP 55845 hydrochloride, GABAB antagonist (ab120337)Montalbano et al PLoS One. 2015 Oct 13;10(10):e0140369. doi: 10.1371/journal.pone.0140369. eCollection 2015. Fig 1. 5-CT-activated inwardly rectifying K+ conductance in 5-HT neurons displays limited desensitization. (A) Time-course of a representative experiment (n = 6) showing the effect of increasing concentrations of bath applied 5-HT1A receptor agonist, 5-CT on inwardly rectifying K+ conductance (G-110/-90 mV) in a dorsal raphe 5-HT neuron. 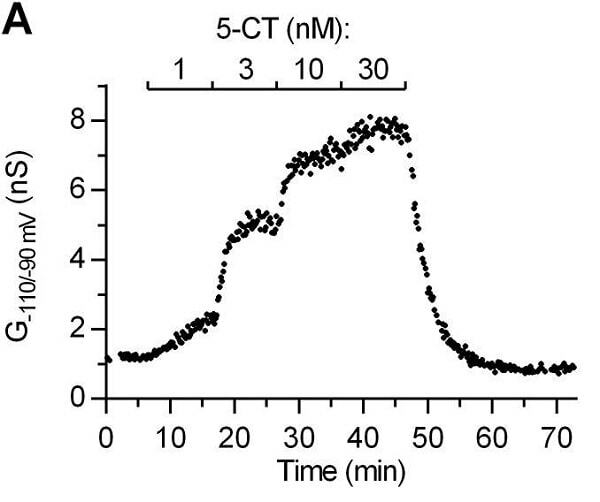 Extracellular solution contained 5.5 mM K+ and a mix of synaptic blockers (including ab120337). In this Fig time indicates duration of whole-cell configuration. Publishing research using ab120337? Please let us know so that we can cite the reference in this datasheet. Phone call requesting information about the solubility of CGP 55845 hydrochloride as the datasheet states solubility as 100 mM in DMSO whilst the CoA states 1 eq. of NaOH. As discussed over the phone the solubility of CGP 55845 hydrochloride is 100 mM in DMSO. The information on the CoA was unfortunately an error. Thank you for bringing this to our attention. This will be altered to reflect the correct information. I hope this information has been of help. If you require any further information please do nothesitate to contact us again.